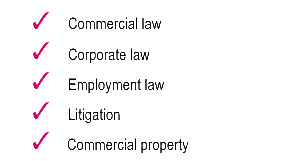 Charterhouse Law is an entrepreneurial law firm with a commercial and pragmatic approach to clients' needs based on experience and values borne out of our combined 40 years expertise gained with top tier firms. We firmly believe in developing a long term relationship with our clients to their benefit. Our advice takes into account our clients' business needs and objectives generally and not just the issue in question. We appreciate that the legal market has changed in recent years, and will continue to do so, which is why we set up Charterhouse Law to enable us to be flexible and commercial on costs whilst maintaining high levels of personal service and integrity. We have a portfolio of clients of varying sizes who see us as an integral part of their business, many of whom have been with us for a number of years preferring the culture, service and attention of our firm over their experience of larger firms.